AVS Free Media Player. 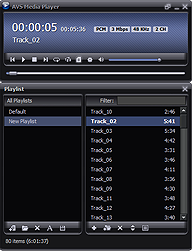 Windows Media player software. rich functionality and a user-friendly interface. Read: AVI, IVF, DIV, DIVX, WMV, ASF, ASX, MPG, MPEG, MPE, M4V, MP4, MVV, M2V, M1V, MOD, QT, MOV, DV, DAT, 3GP, 3G2, 3GPP, 3GP2, MS-DVR, DVR-MS, GVI, OGM, OGG, OGV, MKV, FLV, F4V, F4P, TS, TP, TRP, M2TS, M2T, MTS, AMV, MTV, CDG, NSV, FLI, FLC, RM, RAM, RMVB, RV, IVR, WAV, MP3, MPEG3, CDA, MP2, M4A, WMA, OGG, AAC, MPC, MPP, MP+, AIF, AIFF, AIFC, AU, SND, AMR, AWB, APE, ALAC, FLAC, AC3, BMP, GIF, JPG, JPEG, JPE, JFIF, PNG, TIF, TIFF, PCX, RAS, PSD, TGA, WMF, EMF, WTV. 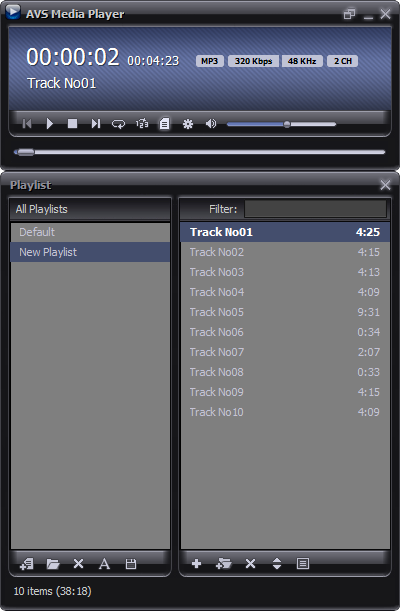 AVS Media Player interface is available in English, French, German, Spanish, Italian, Japanese, Polish and Russian.